Gabriel Saloman Mindel and Alexander Jay Ullman have just published a collaboratively written text on the legendary sound studies web journal, Sounding Out! Using concepts developed through Sound Studies, we consider how a sonic analysis of the play can shed light on the relationship of “Free Speech” to institutions, protest and power. This insight then problematizes the ways in which “Free Speech” is currently deployed, by both the Alt-Right and the University of California in Berkeley. We explore in particular R. Murray Schafer’s notion of “Sacred Noise,” that sound which can not be censured by virtue of its sovereign claim to space, suggesting that the profane noise of protests by the marginalized and oppressed disrupts the given certainty of institutional and institutionalized power. 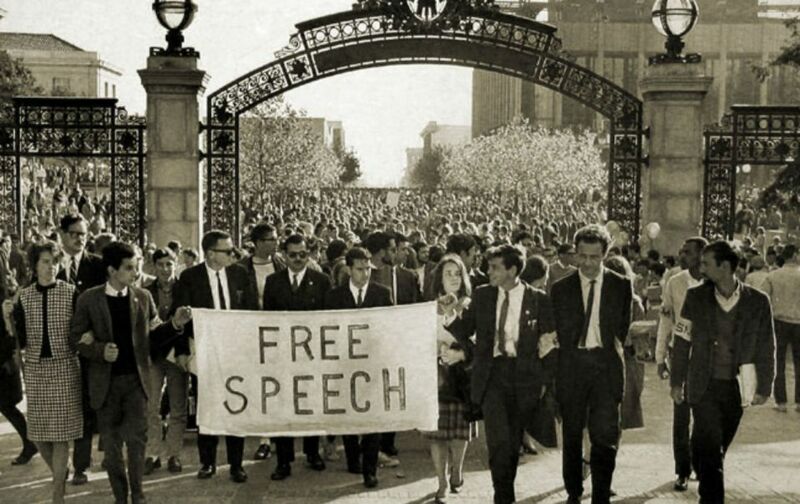 In this sense we contend that the battle for “Free Speech” is in fact a battle for the power or authority to speak and can not be separated from the larger social forces that determine what is considered noise and who makes it. We will explore a variety of material mediums for sound – the pulpit, the soapbox, the church bell, the siren, the drum, the public address system – and point towards those ways in which certain noises, including forms of speech, become naturalized into everyday ambience, while others perform a social rupture that leads to profound and at times violent consequences. Sounding Out! is a weekly, peer-reviewed, online publication, a networked academic archive, and a dynamic group platform bringing together sound studies scholars, sound artists and professionals, and readers interested in the cultural politics of sound and listening. Every Monday, our writers offer well-researched, well-written, and accessible interventions in sound studies, directing the field’s energy toward the social, cultural, and political aspects of sound and listening, particularly their differential construction of and material impacts on variously positioned bodies. Gabriel and Alex will be presenting on this paper at Breaking Through: Textures and Aesthetics of Rupture at The Graduate Center – CUNY English Student Association Graduate Conference on March 23rd, 2018. They will be part of the day’s first panel, Noises, Aesthetics, and Temporalities of Political Resistance.